Ikhwanweb, says Soumia Bardhan, was a rhetorical tool through which the Muslim Brotherhood addressed Western audiences. The message has changed, but the desire to address Western audiences in English remains important. What was the point of Ikhwanweb, the Muslim Brotherhood’s official English-language web site? The Muslim Brotherhood operates pretty much entirely in Arabic. The Brotherhood already had an Arabic web site. So why offer a web site in English? 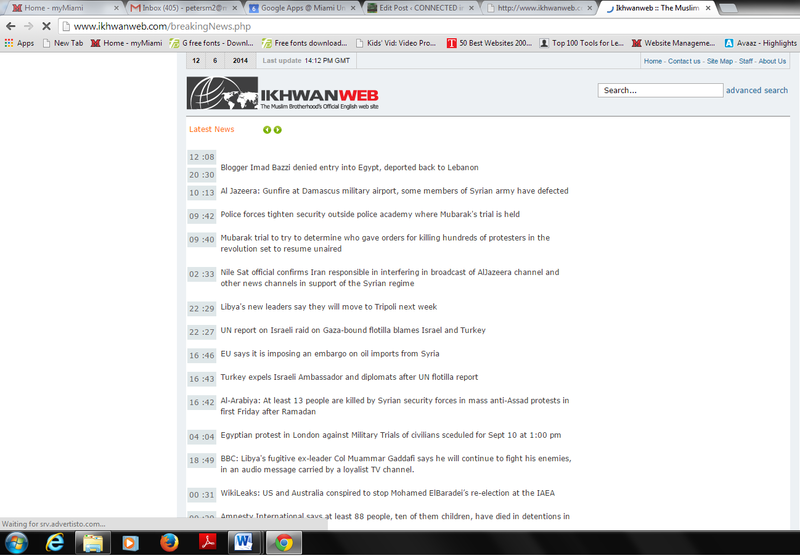 Obviously, Ikhwanweb is designed to address different audiences than the MBs main web site. Who was this audience and what did the MB want to say to it through Ikhwanweb? Those are the questions addressed by an article in the latest issue of the Digest of Middle East Studies (DOMES). “Egypt, Islamists, and the Internet: The Case of the Muslim Brotherhood and Its Rhetoric of Dialectics in Ikhwanweb” by Soumia Bardhan analyzes the rhetoric of the Muslim Brotherhood on Ikhwanweb between 2005 and 2010. I am reminded here of the social theory concept of interpellation. Interpellation is at once a linguistic concept–to interpellate is to address someone in order to interrupt and question, particularly with regard to status or role, and a philosophical concept–it is how ideological discourses address someone to constitute them as a subject. As Bardhan would have it, Ikhwanweb addresses us in English in order to interrupt our conventional ways of thinking about “Islamists” by utilizing specific rhetorical strategies that position it as reasonable, tolerant and struggling for democratic rights against authoritarianism. First, Ikhwanweb sought to undermine and problematic edits the Widespread Western view that Islam is a monolithic ideology that is radical, undemocratic, and inflexible. Second, it sought to undermine Western support for the Mubarak regime by undermining its claims that without authoritarianism, irrational anti-Western Islamists would seize power. Bardhan’s analysis is an analysis of the rhetoric of Ikhwanweb during the last year’s of the Mubarak regime. Today, Ikhwanweb continues to interpellate Western readers through short, laconic postings of news briefs representing a world of ongoing struggle between Muslims and the authoritarian forces that continue to oppress them. Bardhan, Soumia. 2014. Egypt, Islamists, and the Internet: The Case of the Muslim Brotherhood and Its Rhetoric of Dialectics in Ikhwanweb. Digest of Middle East Studies, 23: 235–261. ← Was The Egyptian Revolution Really Revolutionary?